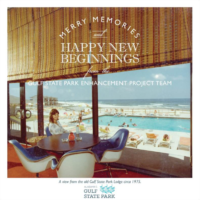 For decades, the Gulf State Park Lodge was the centerpiece of Gulf Shores. Overlooking the clear waters and pristine beaches of the Gulf of Mexico, it was a favorite place to socialize and experience nature. Whether it was enjoying a meal at the restaurant, lounging by the ocean side pool or having the opportunity to stay the night right on the beach, the lodge was vital to the culture of Gulf State Park. Despite the fact that Hurricane Ivan destroyed the lodge in 2004, it remains the subject of many fond memories. In this video, we share memories of what made the lodge so special, from family vacations to dinners at the lodge restaurant, and weddings on the beach. The rebuilt lodge will ensure that the wonders of the park and its beaches will be accessible to all locals and tourists. The parks are an important gateway to enjoying nature, and we look forward to welcoming visitors from near and far to be able to experience Gulf State Park to the fullest.